To download a pdf of the Doherty descendants, click on the title below. We have so much new material! Pictures, stories, biographies, anecdotes . . . It is all in the book: Finding Lawrence’s Family . . . From Ballywilliam to Asphodel. Note to family members: The above file has been privatized. This means that the personal data of all living individuals has been made private. I welcome all enqiries, corrections, additions. E-mail Me if you wish to get more information. If the software included your name by error it probably means I do not have your birth date. Contact me and I’ll fix it. I am also starting with William Doherty’s unknown parents so that I can show his two brothers. We have confirmed a major break-through on the Doherty and Heffernan families. We have confirmed that Lawrence’s parents are William Doherty and Catherine Maxy (or Mackey) from Ballywilliam, a townland in Ballyporeen Parish in County Tipperary, Ireland. The Irish records say Maxy and the Canadian records say Mackey. Since the new immigrants were illiterate at this stage, it is impossible to know which is correct. They were at the mercy of the person transcribing William and Catherine’s marriage record in Ireland or Lawrence’s marriage record in Canada . We have a potential connection between Margaret Doherty who married Patrick Heffernan since she also was married in Ballyporeen Parish. I conjecture that she is William’s and James’sister but have no proof. However, the fact that the Dohertys and Heffernans from Ballyporeen Parish and the Heffernans from nearby Mitchelstown and Kilworth are so closely related in Ireland and in Ontario leads me to suspect that Margaret is from the same Doherty family. According to Paul Heffernan, William also has a younger brother, John Doherty with wife Mary and three daughters, Margaret, Mary and Anne, living in the Peterborough area but I have not been able to confirm this. Records from the Library and Archives Canada tell of the immigration in 1847 of the Doherty families arriving in Cobourg on their way to Gores Landing. James and his family (wife Norry and two sons, William & Patrick) arrived on July 25, 1847 and William and his son, Lawrence, arrived on August 26, 1847. They were listed as indigent families arriving at the height of the famine. I have received information from KARA in Peterborough confirming this research. Our Lawrence Doherty came from Tipperary with his family: his father, William Doherty, Uncle James Doherty, Aunt Honora (O’Donnell) Doherty and their two sons. This matches the six people that Aunt Mary Wilson said sailed from Cork. She believed they were 6 brothers but I believe they were 6 members of the same family. I would like to especially thank Patrick Doherty from Kitchener, who shared his many boxes of files on the Doherty family. Patrick, a second cousin, is absorbed with hockey and has pointed out the many relatives who have been involved in hockey. Patrick even has an arena named after him and we write every year to share the genealogical “news”. He’s not into computers and keeps his files in well-organized binders and boxes. It was wonderful to meet you, Patrick. He is a “pure” Doherty, since my great-aunt and Patrick’s grandmother, Mary Winnifred Doherty, married Patrick Joseph Doherty (no relative to me). Thanks also to the late Fred and his wife, Shirley O’Grady who shared their massive research with me. They welcomed us into their home in Peterborough and we had a wonderful visit. More recently, thanks to Bernadette (Doherty) Guyatt and husband Paul for sharing their information. Another coincidence here- where the Heffernans and the Dohertys are on both sides of my family tree. My ancestor, Lawrence Doherty was married to Johanna Elizabeth Heffernan, another situation where the Doherty and Heffernan families are linked, just as Margaret Doherty married Patrick Heffernan in another part of this large family tree file. But my ancestor is Lawrence’s second wife, Hanorah Mahoney. I have no information on her so if you are reading this and know about her, E-mail Me. The family of Patrick J. Doherty and Mary Winnifred Doherty. My dad’s last party (& last night) on earth at Mary Gibson’s home. Front row: Ellen Elizabeth Gibson Doherty (1914-2009), Rose Doyle, Patrick Lawrence Doherty (1869-1951). The children are Kenneth Patrick Doherty (1940-1972) in the back and Living Doherty. There are two Ellen Dohertys married to two James Herrs- very confusing. The second Ellen Doherty/ James Herr are buried in Norwood, ON. Right-winger Fred Doherty played a couple of games for the Montreal Canadiens in 1918-19. He was best known as a dangerous scorer in the OPHL and the NHA. Born in Norwood, Ontario, Doherty excelled in the OPHL with the Guelph and Galt Professionals. He was one of the first pro stars in the province an accumulated 29 goals in parts of three seasons. Doherty moved to the MPHL’s Moncton Victorias in 1911-12 and was a scoring star there for two years. Doherty joined the NHA’s Toronto Ontarios in 1913-14 and also competed briefly for the Quebec Bulldogs and Montreal Wanderers. After serving two years in World War I, he signed with the Canadiens as a free agent and played a couple of games before retiring. Kathleen Norah Doherty (1904-2003 ). His Aunt Kay provided many stories about the older Dohertys to Pat Doherty of Kitchener. Kay looked after several of Lawrence Doherty’s (1825-1894) children in their old age. She never married. The Doherty homestead- the next generation. William Patrick (Pete) Doherty (1880-1950), his wife, Emma Delaney (1882-1956), with children, William John Doherty (1906-1987) and Mary Hyacinth Doherty (1909-2000). Thanks to Emma Doherty for this picture. William John Doherty (1906-1987) & his bride Lois Marie Minnie (1930-2010), parents of Margaret & Emma Doherty. This amazing picture is from Emma & Margaret Doherty. It shows William J. Doherty and Mary O’Grady and their children.William J. is the first child and son of Lawrence who came from Ireland. My family tree may possibly be a link here. I have a relative Helen Frances Sheahan (also called Nellie) who is the child of Jeremiah Sheahan, Honora Clampett. Helen’s siblings and therefore Jeremiah and Honora children are 1 Helen, 2, Joseph, 3 Katherine, 4, Mary Elizabeth 5 Jeremiah Jr and 6 Thomas Henry. Helen Frances Sheahan (AKA Nellie) married a P.J. Cooney and had 6 children named Marion, Frank J., Josephine, Helen, Lenore and Agnes. I am the namesake and grand dtr of Lenore Cooney. She is my paternal grandmother. Jeremiah’s father was Daniel and his mother is Ellen Shaughnasy born 11/20/1814 in Ballyclough CO Cork. I am unsure if our families are connected. If they are I do have some more info. I am trying to find information about my maternal grand mother, Mary Lillian Marriott (Doherty). She lived in the Timmins-Sudbury area when she married Robert William Marriott of New Liskeard. She had two sisters, Marjorie and Robena, and a brother, Thomas. I wish I could help but I don’t have her in my tree. Doherty is a very common name. Do you have any other info? 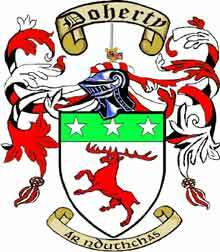 My Dohertys came from Ballyporeen, Tipperary to Ontario, Canada, in 1847.